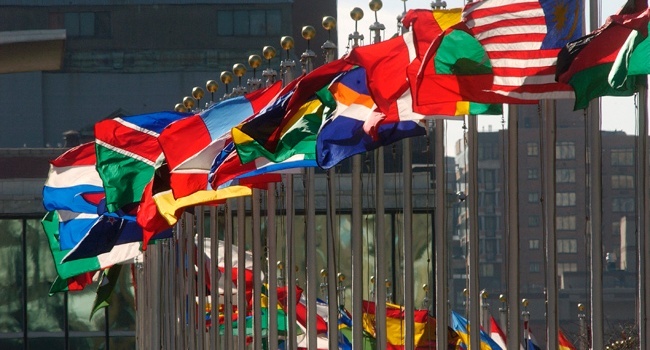 During the past several months, Mercy at the UN has been advocating intensely to influence the UN Post-2015 Development Agenda and the formulation of the Sustainable Development Goals (SDGs). Because these goals will direct UN global development efforts for the next several years, our advocacy efforts will increase in order to ensure an agenda that is truly just, sustainable and people-centered, grounded in an understanding of the rights of people and the environment. The international framework of human rights treaties and accountability mechanisms are increasingly important to our members at the grassroots. Thus, this framework must be the foundation of the SDGs and the broader post-2015 agenda. MIA supports the Leadership Team of the Sisters of Mercy of the Americas in their call on the US Congress to address the issue of unaccompanied migrant children from Central America seeking refuge in the United States. We pray for the welfare and safety of these unprotected and vulnerable children and youth, forced into migration as a result of a culture of fear and hopelessness. Each and every week new readers subscribe to Mercy E-news. We welcome subscriptions from all members of the Mercy network - Sisters, Associates, Family, Friends and Partners-in-ministry as well as anyone who is interested in the vision and mission of Mercy International Association (MIA). We invite contributions of news from your Mercy community or ministry. The Catholic Health Association (CHA) of the United States has named Mary Roch Rocklage rsm, as a recipient of its 2014 Lifetime Achievement Award, recognising how she guided Mercy Health System through momentous growth and change to become a leader in health care delivery innovation and the sixth largest Catholic health system in the United States. The award was presented on 23 June at CHA’s 2014 Catholic Health Assembly in Chicago. The Department of Homeland Security (DHS) estimates that 90,000 unaccompanied children will flee to the United States in the current fiscal year, with 120,000 children seeking refuge next year. Many of these children are very young, with some reports indicating children as young as two or three are crossing the border without an adult. 'This is a humanitarian crisis that must be addressed immediately or it will continue to spiral out of control,' said Sister Patricia McDermott, president of the Sisters of Mercy who sent this letter to members of Congress on June 23, 2014, urging them to address this issue. Addressing this humanitarian crisis is a top priority for the Sisters of Mercy’s Institute Leadership Team. A brief summary of the articles in the issue as well as a subscription form is attached to this item. If you are interested in obtaining a back issue, please contact Marie Michele Donnelly rsm. Women who have suffered from trauma, from physical and sexual abuse, or the disease of addiction need a safe space to transition into a new life. Oftentimes, they are unemployed, homeless and separated from their children and families. Moving forward begins with the help of someone like Sister Beth Heizer, a counselor at Marian House, Inc., in Baltimore. Berneice Loch rsm OAM has been elected as the new President of Catholic Religious Australia (CRA) at the 2014 CRA National Assembly held in Melbourne on 23-27 June 2014. Sr Berneice is currently Leader of the Institute of Sisters of Mercy of Australia and Papua New Guinea (ISMAPNG) and received the Medal of the Order of Australia (OAM) in 2013. Notable among her leadership achievements was her central role in the establishment of Mercy Partners (2004-2011) and more recently the Institute of Sisters of Mercy of Australia and Papua New Guinea. On Saturday 14 June the Sister of Mercy North Sydney celebrated Pentecost with a beautiful Mass and lunch at Monte Sant’ Angelo Mercy College. Since 1997 the Congregation has used the vigil of Pentecost to reflect on the work and importance of our ministries. The theme for this year’s Mass was 'The Fire in Our Lives'. A diverse range of people who have worked with or have a connection with the congregational institutions and ministries— such as Monte Sant' Angelo, The Mercy Foundation and women who formerly belonged to the Congregation— were in attendance. “30 Women, 30 Stories: Journeys of Recovery and Transformation”, is the title of the book created in 2013 aon the occasion of the 30th anniversary of Marian House Baltimore. The book shares the inspirational tales of 30 Marian House alumnae who have overcome lives of addiction, incarceration, homelessness, mental illness, and trauma and have gone on to achieve happy and productive lives. Purchase the book online or listen to these courageous women generously share aspects of their lifestories in the audio companion pieces to the written text. Marian House was founded in 1982 as a joint project of the Sisters of Mercy and the School Sisters of Notre Dame. Marian House is a holistic, healing community for women and their children who are in need of housing and support services. We provide a safe, sober, and loving environment that challenges women to respect and love themselves, confront emotional and socioeconomic issues, and transition to stable and independent lives. 'Catherine knew, however, that it was God's Spirit that was the animating power in her life. She was insistent that it was God who enabled their work to be done and it was to God that the glory be given. Catherine believed that the true spirit of the Sisters of Mercy was the animation given to their human spirits by God's own Spirit, the Spirit of Christ. Consequently, she believed that her unique obligation as their founder was to support and nurture this animation. To be animated by the Spirit of Christ was to manifest all the God-given and humanly sustained liveliness of the true spirit of the order, the spirit of mutual love and service of the poor'. Handling things once; having a system; channeling anxiety for the better. These are proposed as three of the 12 habits of highly productive people. 1851: St Joseph's Church, Cordier Hill, Guernsey, Channel Islands designed by A W Pugin opened. The text of the reflection Pope Francis seeking the Wisdom of Women, a presentation given at the recent Broken Bay NSW eConference (refer Mercy E-news 18 June), by Monica Cavanagh rsj, Congregational Leader of the Sisters of St Joseph of the Sacred Heart, has now been posted online. It can be read here.